11 Things that made us talk Mental Health in 2016! What made us talk about mental health in 2016? The short answer is a little bit of everything! From senseless killings to hashtags to Solange’s latest album to Myleik Teele’s podcast mental health, mental illness, and self-care are becoming more common for us to talk about. Even though there is still a lot of stigma around mental illness and self-care, 2016 can be classified as a year of progress! In no particular order, let’s take a look at 11 things that made us talk about mental health last year! NYC Well & Chirlane McCray: ThriveNYC: A Mental Health Road Map for All was released in November 2015 and gave an outline of 23 new initiatives for New Yorkers mental well-being (there is a total of 54 initiatives outlined). The NYC.gov site gives data on why these programs are needed, and one of the numbers that stands out is 14 Billion; that is the estimated amount of dollars lost annually because of losses in productivity. This astounding amount isn’t the only reason NYC’s First Lady Chirlane McCray made mental health her signature issue. In September 2016 Chirlane sat down with Essence and discussed promoting mental health, read it here. In the article, she is open about mental illness in her own family, which many people in the spotlight don’t discuss. In October 2016 NYC Well launched and it is a free, confidential connection to mental health support for New Yorkers. The Veteran’s suicide Rate: The Department of Veterans Affairs released a study in July of 2016 that states on average 20 Veterans a day are committing suicide. About 18% of all suicides in the United States are U.S. Veterans, however, they make up only 9% of the U.S. population. Throughout 2016 Veterans Affairs had come under fire for various issues related to the care of our veterans, but the release of this number is staggering. While providing assistance can be difficult if Veterans are not reaching out for help, the VA has increased the amount of mental health providers, support personnel, and established partnerships with community health providers. Dr. Phil’s interview with Shelley Duvall: Shelley Duvall was a famous actress and not many people knew she had been diagnosed with a mental illness until she appeared on The Dr. Phil Show. Dr. Phil offered to get Shelley professional help, however, many people felt that this interview was exploitation. Even though Duvall consented to the interview, those that opposed the interview feel if she were well she wouldn’t want the interview to be aired. The controversy of this episode was so serious, to date, we have not been able to find the full episode online. Kid Cudi: Black Men’s Mental Health captured the spotlight when Kid Cudi took to Facebook on Oct. 4th, 2016 and shared his own struggles with depression. The post, which has 137k shares, states he has been living a lie, living with depression, anxiety, and suicidal urges. He also admits he is nervous about the next steps but he has to do this not only for himself, for his family and fans. #yougoodman: According to the Huffington Post, #yougoodman began on Twitter during a conversation between @DaynaLNukolls & @TheCosby. The hashtag was created for Black men to have a safe place to discuss mental health. This hashtag is significant because men have higher rates of suicide and also because mental health in the Black community is swept under the rug and not discussed. Kanye West: In November of 2016 Kanye West went on another rant during a show. At this point, a Kanye West concert isn’t a Kanye West concert without at least one 20 minute rant! However days after he abruptly ended the Sacramento show he was hospitalized in LA, some reports say due to exhaustion other reports say he was placed on psychiatric hold. There was even a leak of a mental health evaluation that supposedly belonged to Kanye. Although we may never hear from West about why he was hospitalized it reignited the conversation about Black men’s mental health. A Seat at the Table: Solange Knowles released her third studio album on September 30, 2016. This album was described as a therapeutic collection of soulful tunes by VH1.com and some features include Lil Wayne, Kelly Rowland and BJ the Chicago Kid. The interludes on the album from Mama Knowles, Papa Knowles, and Master P make you really understand that this album is about the Black experience. A Seat at the Table is Solange’s first number one album in the U.S. and the song Cranes in the Sky is grammy nominated. This song is the most therapeutic song on the album for many. “I tried to drink it away/ I tried to put one in the air/ I tried to dance it away/ I tried to change it with my hair”, this opening verse makes you want to hear more probably because we have all had issues we have tried to deal with in various ways. Cranes in the Sky describes a metal clouds in the sky (those things that weigh on us and that follows us everywhere). Bipolar Faith: “Monica A. Coleman’s great-grandfather asked his two young sons to lift him up and pull out the chair when he hanged himself, and that noose stayed in the family shed for years. The rope was the violent instrument, but it was the mental anguish that killed him.” These are the first two lines of the description on Amazon to Bipolar Faith: A Black Woman’s Journey with Depression & Faith. This book was published in July 2016 is “both a spiritual autobiography and memoir of mental illness” that discusses Monica’s own journey with bipolar II. What is sure to make her story more interesting is the fact that Monica is a minister and a Professor of Constructive Theology and African-American Religions at Claremont School of Theology in southern California. Click here to read more about Bipolar Faith and other books written by Dr. Monica A. Coleman. Myleik Teele asked a therapist: Myleik Teele is an entrepreneur and does a podcast when time permits about lessons she has learned in business and in life. Curl Box is a huge success and Teele is open about her struggles with starting the subscription-based business, previous relationships, dealing with her achievements. One area she has also been open about is the fact that she has a therapist. A happy, successful Black woman that discussed having therapist was bound to get a lot of questions from her followers, so she dedicated an entire podcast to questions for a therapist. Myleik has met all of her podcast guests, so when she ran into Jor-El Carabello again, she asked him to do the podcast! Jor-El Carabello, who isn’t Myleik’s therapist, is a licensed mental health counselor in New York. The interview ranged from ways to find a therapist to advise for a young woman whose mother is suffering from mental illness. Listen here on podomatic or find it on iTunes. A couple of Teele’s other podcasts that made us talk about self-care, self-fulfilment, and self-esteem: How I Found Peace & Happiness: A chat with Necole Kane. Myleik and Necole Kane, of xoNecle, have girl talk about dealing with change and what finding happiness looks like. The other was a surprise podcast sparked by a listener’s letter. A Letter for Late Bloomers & Comparison will make you rethink your own success and question the story we tell ourselves. 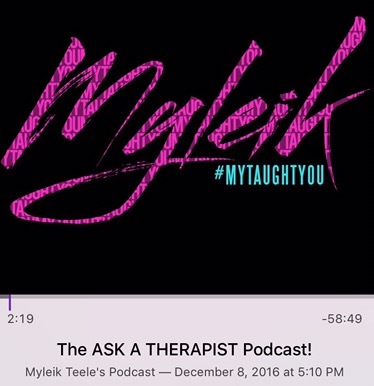 Check out a listing of all of Myleik Teele’s podcasts here. TRUMP! Yes, our President-elect Donald Trump made us all discuss mental health and mental illness. Even though we questioned his mental wellness at times, our main concern was the way he answered questions about our Veterans and mental health while on the campaign trail. While he acknowledges the high veterans suicide rate, he also seems to suggest that some soldiers have mental health problems because they are not strong enough to handle things they see during wartime. His comments upset many people, but also made us take a closer look at PTSD and the Veterans suicide rate. Trump becoming our next president is sure to give most of American some added stress and anxiety so he may make the list again next year! Are we ignoring mental illness? Depression. Anxiety. ADHD. BiPolar. These are some common words were use or hear almost daily in our conversations, on the news, or on our favorite television shows. We are hearing more about the importance of mental wellness, and self-care. We see the green awareness ribbons and read the stories about our veterans’ suicide and PTSD rates. This 6-year old’s death may have been a suicide. 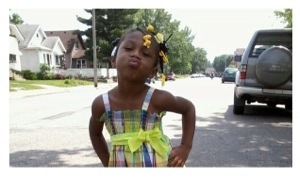 Kendrea Johnson, age 6, was found with a jump rope around her neck and was later pronounced dead at a local hospital. It’s reported that young Kendrea Johnson and her younger brother were taken away from their mother and placed in foster care in December 2013 or January 2014. Records indicate she began acting out, and her mental health became a concern. The Star Tribune reports that Kendra “..told her court-appointed child advocate that she wanted to be back with her family.” A young child being taken away from her family and forced to live with strangers can be a traumatic experience. While many of us are aware that children can suffer from mental illness, how many of us think about the mental health of our young children? 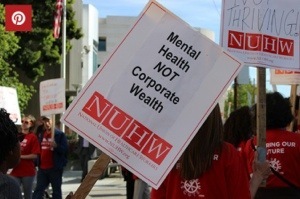 Mental Health care workers at Kaiser Permanente hospitals in California are on strike this week. Why? According to The National Union of Healthcare Workers (NUHW), Kaiser does not properly staff their hospitals to provide the care patients need. There are reports of many patients not being able to get follow up appointments for months. Anyone with a mental illness or that needs treatment knows that delays in treatment puts recovery, in jeopardy. As a person who has been in therapy, the key for me was the weekly appointments. As a person who has a loved one with a serious mental illness, it is necessary that she able to see her doctors once a month, minimum. The strike is expected to last one week; it began on Monday January 12, 2015. Read more from the President of NUHW on why workers are striking here. Schizophrenia + A Daily Routine = Road to Recovery? That is what worked for writer Michael Hedrick. In a recent story on a NY TIMES blog, Hedrick tells how after a couple of bumps in the road he was able to develop a routine. Up at 7am each day and ending his day around 9pm each day, he says the routine “….gave me great comfort to not have to deal with the unexpected.” This … Continue reading Schizophrenia + A Daily Routine = Road to Recovery?